While the words evoke memories of story told in worship, church school and around family suppers it is the illustrations, in this case, that open possibilities of new insights for young and old alike. You know immediately that something is different as the first page introduces you to a Gabriel you may not have considered before – an angel wearing combat boots. It makes sense, really. They are quite busy in the infancy narrative, appearing to Mary, the shepherds and singing with the choir of heavenly hosts, and though they bring “good tidings” they find themselves in uncharted territory announcing the birth of the Messiah. Vivas continues to fascinate – tattered wings, angels in trees, an unsuspecting Mary hanging laundry and an annunciation over a cup of tea at the kitchen table. Many pages have no words but the message is quite clear as she shares the news with Joseph and grows great with child. This Mary is real, and really pregnant, as she and her betrothed figure out how to get her up on the donkey to head to Bethlehem, join those who head home for census and encounter “no room in the inn.” Each page is a delight to the eye but I think my favorite is the one where Joseph is holding the “new born babe” while he provides back support for an exhausted Mary. There are so ways in which this book can be used beyond a simple and straightforward reading. Readers and non-readers alike can “tell the story” in their own words using only the illustrations as prompts. This can be done in small groups with the book or in large groups projected on a screen. Music, from the “Messiah” to “Mary, Did You Know?” can be added to a timed projection or reflection questions created for each illustration that probes the deeper meaning and personal engagement….Why do you think the angel wore combat boots? What do you think about tattered wings on angels? Why would they be tattered? Why do we rarely see Joseph holding the baby? In what ways might your own expression been similar or dissimilar to those of the shepherds? In what ways do these illustrations help you think differently about the Christmas story? However you choose to use it, I commend its use to you. It is a beautiful and startling rendering of the coming of Jesus. Dr. Rebecca Davis, who was part of the original teaching team for the course that was the impetus for this blog, offers this summary of one of her favorite Christmas books. Becky is a graduate of the Seminary and now teaches at Presbyterian College in Clinton, SC. 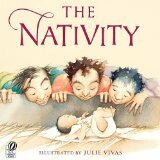 The Nativity by Storypath is licensed under a Creative Commons Attribution-NonCommercial 4.0 International License. This is a beautiful book– one of our favorites, too.